this past Friday say the TV premiere of 「やがて君になる」 / “Yagate Kimi ni Naru” (“Bloom Into You”), a new anime based on the on-going manga of the same name by 仲谷鳰 / Nio Nakatani. while those who understand Japanese will benefit from the trailer shown above (and here, have another one), continue reading if you’re able to stomach my rudimentary rendition of the basic premise of the anime and what happened in the first episode that has me clinging to my seat in the hope that this particular series may not be your typical 百合 / yuri (sapphic / lesbian) story, but rather an aro/ace coded, mixed orientation ‘love story’. a story about two girls– one an avid reader of romance manga who struggles with having never once experienced for herself the love she reads about, the other having never experienced attraction to anyone before suddenly having newfound feelings for her friend– trying to navigate their new found feelings (or notable lack thereof) for each other and what that may or may not mean for their relationship. “…what do you mean, you don’t understand…?”, the surprise apparent on Touko’s face. their eyes met as the smile returned to Touko’s face and she nodded in agreement. validated and encouraged by Touko’s words, Yuu picks up her phone to finally give the classmate who had asked her out her answer. as the phone rang, Touko took Yuu’s hand into hers, squeezing it gently. with a sigh of relief and a weight seemingly lifted from her shoulders, Yuu lowered the phone from her ear as she hung up. 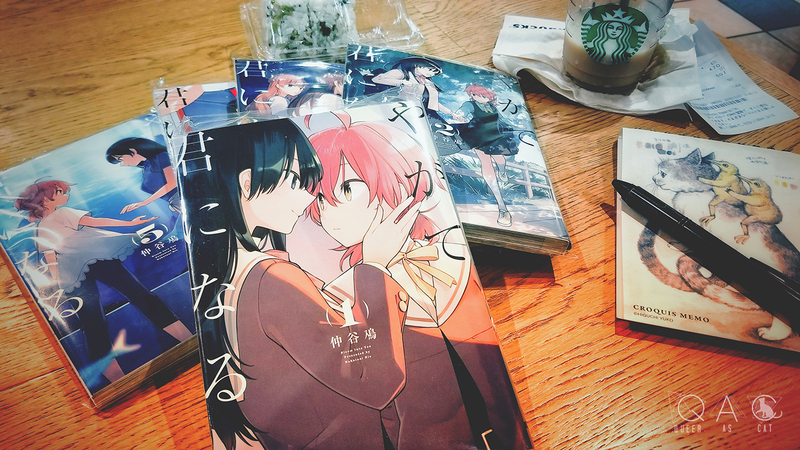 releasing Touko’s hand, she moved to withdraw her own hand when Touko suddenly grabbed her hand firmly, tugging her back. staring down at Touko’s hand in confusion, it suddenly occurred to her that it wasn’t her palm that had become sweaty. “you said you don’t understand what it means to feel ‘that way’ about someone, right?” Touka said with seemingly sudden urgency. “that’s right. i’m sure that i don–” Yuu began, taken aback by the repeated question, eyes wide as she pulled her arm back more forcefully, attempting to free her hand of Touko’s, only to have Touko pull her back with enough force that Yuu, having lost her footing, ended up in Touko‘s embrace. and with that, the moment was over and Touko rushed off, leaving Yuu looking down at her hand in confusion. another day, another student council meeting. Yuu had begun to question whether Touko even remembered what she’d said to her the other day, let alone if she actually meant it. things had seemingly returned to ‘normal’ with no acknowledgement on the part of Touko that the conversation had even taken place. unlike last time, however, there were four people in the meeting room, and yet it was mostly Yuu that Touko seemed to be addressing. Yuu was new to student council proceedings, after all. “…wha? ?” Yuu was stunned, along with everyone else. the crossing of personal boundaries aside (which is a big aside, mind you, but #BecauseAnime…), i thoroughly enjoyed the first episode– particularly the lack of erotica and fan service that this genre of anime is fraught with. i even have [poor quality] video of my favorite parts of it, which i thought about sharing here, but you know. copyright infringement. either way, i still wanted to share my findings and felt like word vomiting something that didn’t pertain to me personally for once, so here we are. also, my hand may have…. slipped and i may have ‘acquired’ secondhand copies of the 5 volumes of the manga that have been released to date. there are a million and one things that i ought to be doing, reading manga not being one of them, but hey! i want to jump ahead of the anime and get a better sense of the direction that this story is going in. will it be well written? am i going to regret my uncharacteristic optimism? eh. if i can speed through the manga quick enough to be done with them while the anime is still airing and the manga is still in demand, i can always resell them and repocket a fraction of the money spent on them. will endeavor to keep those interested posted. for reference, the actual Japanese wordage. I’m actually surprised that this article popped in my mail as newsletter, because I also watched the first episode and I did sense something aro-spec-related happening between the lines but, you know, it being mainstream media and romance/shoujo-ai on top of it, I thought I’d just been reading too much into it and of course pshhh, nobody would bother with representing a-spec (but in this case more aro-spec) identities, and I thought I was the only one to notice… so I’m glad someone else did! Some parts of their conversation really did feel like they were talking about things related to aromanticism (most notably the mention of the pervasive notion that romantic love is the be-all end-all goal for everyone and you couldn’t possibly be whole without so you gotta force yourself to feel it and enter relationships and all that jazz). But on the other hand, I’m still not optimistic and trustful enough of any type of media (unless it’s, like, webcomics and fanfiction which wide audiences wouldn’t consume anyway) having even the slightest intention of representing us, but then again Kiryuu-sensei Wa Renai Ga Wakaranai was the first published piece of media I’ve ever heard of having an aro/aro-spec main so, I don’t know, maybe something surprising could happen with this anime and manga. Anyway, on to the main reason why I wrote this comment: since it’s not licensed in my country and I’m fairly curious (and cautiously excited), once you’re done reading the volumes you got, will you write something about the direction the manga took in this sense? Although… again, I’m very cautiously hopeful, but who knows? Maybe anything could happen, even if it stays between the lines. I’m just really starved for aro or aro-like content outside of discourse. i’m glad that i’m not the only one who noticed, either! actually, i only realized this after posting the above blog post, but apparently i wasn’t even the first one to notice and talk about this particular anime in the context of possible ace / aro characters. Ace Admiral wrote a review of the first 5 volumes of the manga, which might interest you… especially when it comes to the warning that you may want to read before watching tomorrow’s episode. i may have lost a bit of my [cautious] optimism after having read that, to be honest, but i still intend to read all of the manga for myself and will make another post regarding my feelings about it and the direction that the anime may, subsequently, also be moving towards.